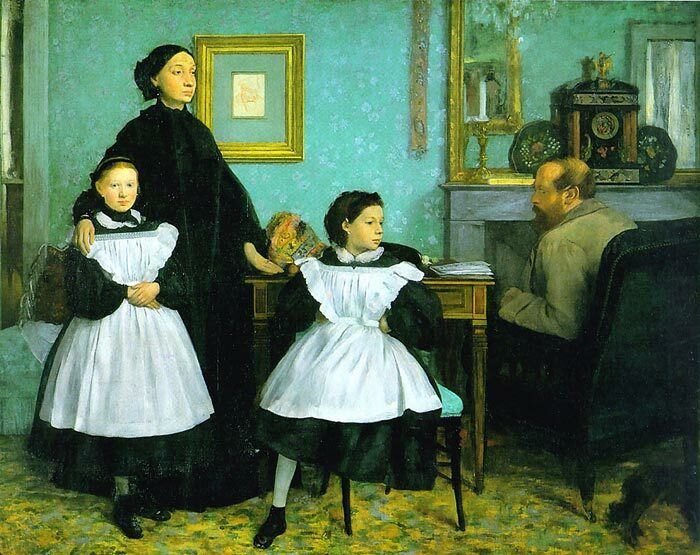 In 1856, the aspiring young French artist Edgar Degas traveled to Italy to study the work of the Renaissance masters and to visit members of his extended family. After stops in Naples and Rome, he stayed for several months in Florence with his aunt Laura; her husband, Baron Gennaro Bellelli; and their daughters, Giovanna and Giulia. Following his return to Paris in 1859, he spent much of the next year turning his many drawings of his cousins and their parents into what is now regarded as one of the most penetrating family portraits ever made. The Bellelli Family reveals the young Degas's talents not only as a painter but also as an astute observer of interpersonal relationships. SPECIAL NOTE : The painter will make the reproduction as close to the original oil painting as possible. If you want your painting to alter from this likeness, please email us and " The Bellelli Family, 1859-1860 " will be reproduced according to your special requirements.